Pictured at the right is In Hyuk Suh, founder and Grandmaster of Kuk Sool Won. 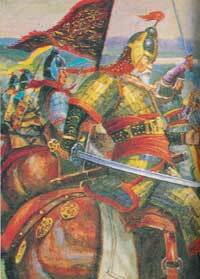 When Kuk Sa Nim (Grandmaster) was young he devoted himself single mindedly to the martial art world. His focus was solely on training, forgetting everything else, sometimes even forgetting to eat and sleep. Traveling from province to province and village to village, he learned from over one hundred masters. They taught him the hidden secrets of martial arts that have been developed and refined over centuries by generations of martial artists. There were masters that only taught him one special technique. After years of learning and research Kuk Sa Nim did not want to keep the priceless arts of his ancestors to himself. After much meditation and consideration, he decided to teach the ancient martial arts of Korea to the public. 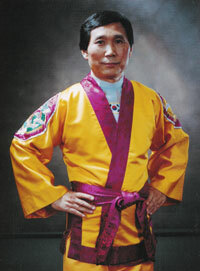 This is when he founded Kuk Sool Won, the Korean National Martial Arts Association. Kuk Sool Won is a systematic study of all of the traditional fighting arts which together comprise the martial arts history of the Korean nation. As such, Kuk Sool Won is an extremely well-organized system of martial arts which seeks to integrate and explore all aspects of the traditional Korean martial arts. As a martial arts system, Kuk Sool Won covers the entire spectrum of the traditional Asian fighting arts and techniques of body conditioning, as well as mental development and traditional weapons training. These include, but are not limited to the following. As you can see, Kuk Sool Won covers an extensive variety of techniques and martial arts methods, but it is not merely concerned with the physical methods of attack and defense. Kuk Sool Won includes the study of healing techniques, the development of internal power, and physical conditioning. Training in Kuk Sool Won also helps to instill self-confidence and self-discipline, a calm self-assurance, and the psychological and spiritual values which are traditionally associated with the martial character. Mental and physical well-being is of primary importance in Kuk Sool Won. Although Kuk Sool Won as it is practiced today is relatively new, its roots stretch far and deep to the very beginnings of the Korean people. As students of Kuk Sool Won, this early history and the ancient traditions upon which our art is founded should be as important to us as the physical techniques themselves, for it is only from our understanding and appreciation of these classical roots that we are able to grow as students of the martial arts.